The hop crop is a hot topic as the craft brewing industry’s thirst for new, locally grown flavors and aromas powers how and where farmers grow the key ingredient in beer. 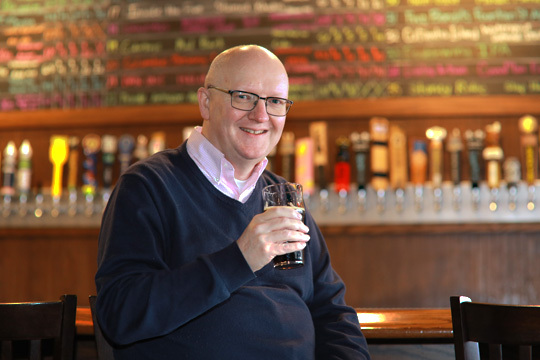 Dr. Neil Reid, professor of geography and planning, will talk about the craft beer revolution at the Wisconsin Hop Seminar in February. Reid, who is teaching a new class this semester at UT titled The Geography of Beer and Brewing, will speak about the impact of the craft beer revolution on the American hops industry at the 10th annual Wisconsin Hop Seminar hosted by University of Wisconsin-Extension on Saturday, Feb. 16, at the Hillsboro Brewing Co., located at 815 Water St. in Hillsboro, Wis. The deadline to register is Thursday, Feb. 7. The event connects craft beer brewers, such as the brew masters for New Glarus Brewing Co. and South Shore Brewing, with hop growers and University of Wisconsin experts in a variety of fields, including plant pathology and breeding. 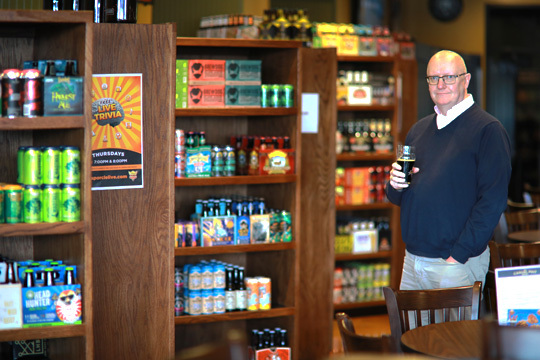 Reid is an expert on the craft brewing industry and its economic geography. His research is focused on the industry’s growth in the United States and its potential role in helping to revitalize neighborhood economies. The volume of craft beer sales increased nationwide in 2017 to 12.7 percent of total U.S. beer sales, but more than 23 percent of the $111.4 billion U.S. beer market, according to the Brewers Association. Reid said the hops farms in Michigan, Ohio and Wisconsin are small compared to ones in Washington, Idaho or Oregon that together grow 95 percent of all hops in the country. While four ingredients go into making beer — hops, barley, water and yeast — hops have grabbed most of the attention of consumers since its flavor and aroma are dominant. Until around 2011, farmers in the Pacific Northwest mostly focused on alpha hop varieties that are used to give mass-produced beers like Budweiser and Miller Lite their bitterness. Instead of alpha, independent brewers want aroma hops that give beer flavors such as orange or fragrances like pine, and dual-purpose hops that are a hybrid of aromatic and bittering hops. As mass-beer makers focus on consistency so each bottle tastes the same, Reid said craft brewers enjoy creativity using different combinations of more than 125 varieties of hops, including Citra, Cascade, Chinook, Centennial and Mosaic. To learn more about the evolving appetite of craft beer drinkers and the experimentation of craft brewers, tap into Reid’s blog about the beer industry at thebeerprofessor.com. This entry was posted on Thursday, January 24th, 2019 at 3:58 am and is filed under Arts and Letters, Events, News, Research, UToday .